Scientists from Queen's University in Belfast have found three new planets orbiting their own stars. The new discoveries have been named Wasp-1, 2 and 3 respectively. They are all gas giants similar to our Jupiter. Using equipment they built themselves, the scientists from the University's Astrophysics Research Centre have been observing hundreds of thousands of stars for several months. The team is hunting what are known as exoplanets. These are planets outside our Solar System. They orbit their own stars, or suns, many of them in just a couple of days, unlike the Earth which takes a year to make a full orbit. Indeed, some of the planets discovered so far are so close to their stars that their "surface" temperatures probably exceed 2000C. So there is little chance of life being present. The search is based on a simple idea. Astronomers know that if a planet is big enough, as it passes in front of a star it will partly screen a star's light from Earth. By watching for this tiny change in light, the astronomers are alerted to the possibility of a planet. Don Pollacco from Queen's University watches the output from their SuperWasp project every night. "The little dip in the light tells that maybe there is a planet there. "It certainly tells you that something has happened and we need to use other telescopes to find out what is causing it," he said. When they have identified a star with a candidate planet, they train a massive 4.2m telescope, the William Herschel, on the star and watch it night after night. Eventually, if there is a planet passing, or transiting the star, they will see the light dip. By measuring the speed and amount of dip, the astronomers can quickly calculate the size of the planet and its distance from the star. 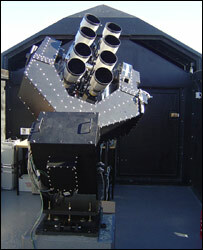 SuperWasp is really eight very sophisticated digital cameras that scan a wide arc of the sky every night. It logs the position and brilliance of hundreds of thousands of stars. The Wasp sits on top of an extinct 2,500m-high volcano on La Palma in the Canaries. It gets a clear view of the sky most nights and is far above the clouds that often surround the island. Using computers, the astronomers in Belfast then sift through the data looking for the subtle changes of light. Wasp stands for Wide Angle Search for Planets. The sheer quantity of stars it checks out every night means it's more likely to discover new planets on a regular basis. A SuperWasp system has also started operating in the Southern Hemisphere, in South Africa. It has also discovered two exoplanets, Wasp-4 and Wasp-5. "We're the only team to have found transiting planets in both the Northern and Southern Hemispheres; for the first time we have both SuperWasp cameras running, giving complete coverage of the whole sky," said Dr Pollacco. It is also proving to be a very economical exercise. 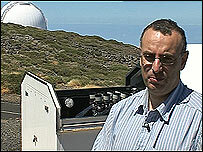 The Wasp on La Palma cost about £400,000. So far, that works out at just over £130,000 a planet; and it will get cheaper by the planet if they find more. SuperWasp has also received recognition from its peers. Normally astronomers would be delighted to get one or two nights on a major telescope such as the William Herschel on La Palma. Queen's University has already been given 100 nights - because of the potential of SuperWasp. Already the three planets that have been confirmed in the Northern Hemisphere have had their coordinates and other details made available through a link-up between Queen's University and the BBC. Details, including the coordinates can be found by clicking here.